What Is DA Form 7223? DA Form 7223, Base System Civilian Evaluation Report is a form for rating the achievements of civilian employees under the Total Army Performance Evaluation System (TAPES). The latest version of the form - sometimes incorrectly referred to as the DD Form 7223 - was released by the Department of the Army (DA) in March 2010. 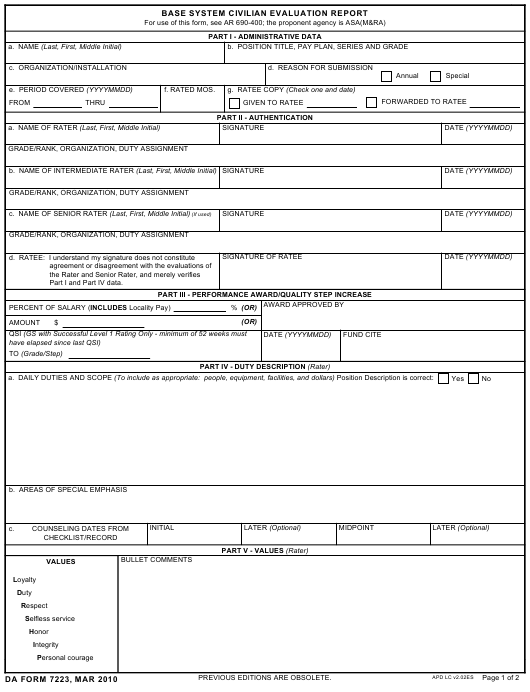 An up-to-date DA Form 7223 fillable version is available for download and digital filing below or can be found through the Army Publishing Directorate website. The DA 7223 is a form related to the DA Form 7223-1, Base System Civilian Performance Counseling Checklist/Record, used for recording performance reviews and expectations related to the employee's performance, as well as documenting future performance plans. Part I and Part IV data. Specific bullet examples of other than "SUCCESS," are mandatory. Specific bullet examples of "SUCCESS" are optional but encouraged. All filing information and guidelines for the DA 7223 can be found in the Army Regulation 690-400, Chapter 4302 Total Army Performance Evaluation System, released in October 1998. Part I - Administrative Data - requires personal information of the rated individual, including their full name, position title, pay plan, series and grade, the name of the organization or installation and the reason for submitting the form (either an annual evaluation or special performance). Part II - Authentication - should provide an authentication of the raters performing the evaluation. This includes specifying their name, grade, rank, organization, and duty assignment. The form provides three boxes for a maximum of three raters: the main rater, an intermediate rater, and a senior rater. This part of the DA 7223 should also have a signature of the evaluated individual to verify that the data given in Parts I and IV is correct. Part III of the DA Form 7223 - Performance Award/Quality Step Increase - should provide information on the monetary amount of award or a raise to another grade or step. Part IV - Duty Description - should be completed with a full description of the duty performed by the evaluated employee. It includes the description and scope of their daily duties, areas of special emphasis and the correct counseling dates. Part V - Values - starts with a list of seven core Army values: loyalty, duty, respect, selfless service, honor, integrity, personal courage. Part V provides a space for any additional bullet comments and is filled out by the senior rater. Section B of Part V contains an evaluation of the employee's skills. Those include their technical competence, adaptability and initiative, working relationships and communications, and their overall responsibility and dependability. Personnel in positions with supervisory duties are also rated on their supervision and leadership, EEO and affirmative action. Part VI provides an evaluation of the employee's overall performance. This part is filed by a senior rater (if used) or the main rater (if no senior raters took part in the evaluation). Part VII is for the senior rater's commentary and notes on the employee's performance.